Translated by Samuel Butler. The Odyssey, in part a sequel to the equally famous Iliad, is the second oldest extant work of Western European literature, composed in the eighth century BC. It tells the story of the Greek hero Odysseus (known in Rome as Ulysses), king of Ithaca, and his ten-year-long journey home at the end of the Trojan War. Originally written as a poem in Greek dactylic hexameter, the title of this classic work gave rise to the word odyssey as meaning any epic voyage. The Odyssey was regarded as a cultural treasure in the time of Classical Greece and its importance did not diminish with time. The Renaissance allowed its appearance in Western Europe and it has remained an important part of European culture and heritage for nearly three millennia. This version has been completely reset using the classic English translation which converted the poetry to conventional text. About the author: Almost nothing is known about the poet Homer, in spite of the endurance and power of his works. According to Herodotus, the allegedly blind poet Homer lived around the year 850 BC but noting is known of where he lived, where he died or if he even actually ever or if his name was just a generic Nome de Plume used by a number of unknown writers. Nearly half of all identifiable Greek literary papyrus finds are attributed to Homer. 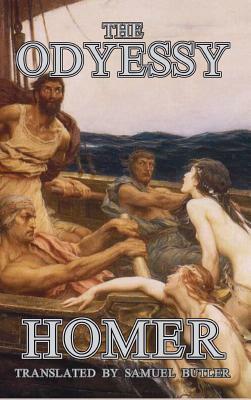 Odysseus's adventures include: - Being held captive by the nymph Calypso who has fallen in love with him. - A visit to the lethargic Lotus-Eaters who gave two of his men their fruit which caused them to forget their homecoming. - A capture by and escape from the Cyclops Polyphemus, who is blinded by a wooden stake. Polyphemus tells his father, the sea god Poseidon, who then causes natural disasters which cause Odysseus to take ten years to reach home. - A visit to the Underworld, and much, much more.